Sharpening system DMT Diafold Magna-Guide Kit(MAGKIT-4) Knife accessories, sharpeners, sharpening stones. Four diamond grit guided sharpening in a sturdy carry case! 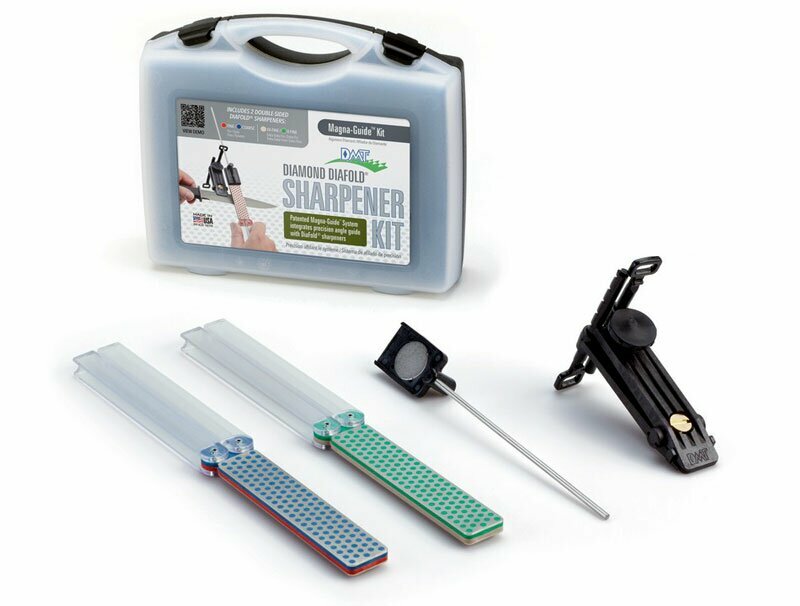 The Magna-Guide kit offers portable sharpening using 2 Double Sided Diafold sharpeners. The Aligner Blade Guide (ABG) provides 7-Angle adjustability for the right edge every time, and the MAG – Magnetic Angle Guide joins the two! The Double Sided Diafold Sharpener offers two 4" x 1” Diamond Whetstone surfaces in one lightweight, portable sharpener. Use precision guided sharpening on blades and knives; use the Diafold alone on a variety of edges in the home, shop and garden.